Spitfire Mk. VII EN474 flying over the plains of Ohio in the summer of 1943. 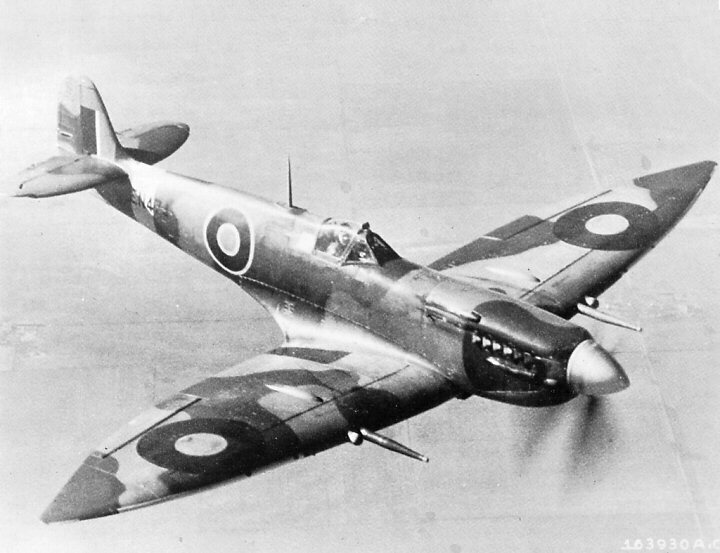 This aircraft, the 13th production high-altitude Mk. VII was supplied to USA for evaluation. In the USAAF service, the aircraft retained its British camouflage and serial, although it was later assigned the evaluation number FE-400. An air intake for the Marshall compressor for the pressurised cockpit placed below the starboard exhausts was the characteristic feature of the type, as was the Lobelle type sliding canopy. This aricraft, however, was one of the earliest Mk. VII and featured a non-sliding pressurized hood inhereted from the earlier Spitfire Mk. VI. EN474 is currently in the Smithsonian. What is different with this a/c is the airframe was puttied and sanded, so the only panel lines are those of removable covers or doors. The rudder is the “standard” type, not the Mk.XII. The most interesting feature of the airframe is the canopy. It is not the more common LoBelle type, but is non-sliding. The locking handles are visible on the inside of the canopy. If I can dig up an image I will post it.